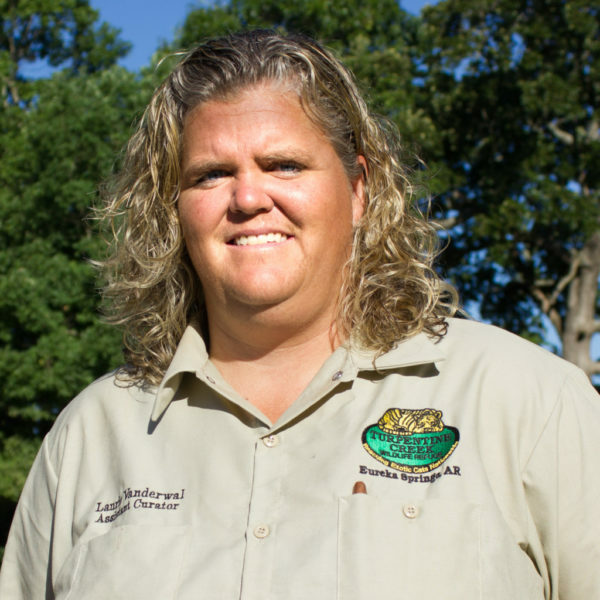 Laurie Vanderwal of IIderton, Ontario is the Assistant Curator and Gift Shop Manager at Turpentine Creek Wildlife Refuge. With her BS in Zoology from the University of Guelph in Guelph, Ontario, Laurie heard about the Refuge first from a friend who found a link connected to Texas A&M and then through paper postings on the bulletin board of her university’s career center. Having a lifelong passion for animals and wanting to be their voice, Laurie came to the Refuge first as an intern, then became a member of Animal Care Staff, and now serves as the Assistant Animal Curator. As Assistant Curator and Gift Shop Manager, Laurie’s job consists of whatever needs to be done! Welding, construction, animal care, guest services, and managing the gift shop are just a few of the things that she works on in a single day at the Refuge. Describing herself as “a proud Canadian citizen, eh…” Laurie has a passionate love for the Ozark Mountains and Northwest Arkansas!